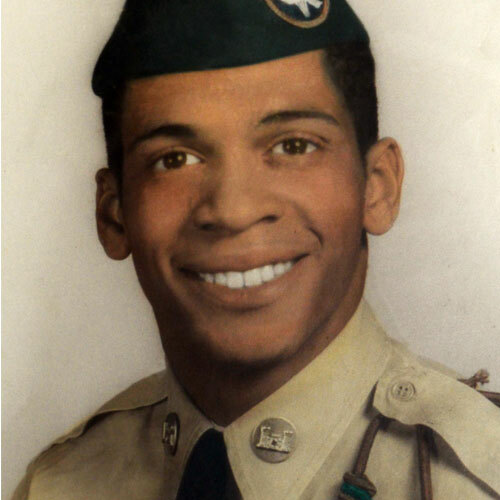 Medal of Honor nominee Melvin Morris was born in Okmulgee, Okla., Jan. 7, 1942. Morris entered the Oklahoma Army National Guard in 1959 and later requested to join the active Army. He became one of the first Soldiers to don the ‘green beret’ at the command of President John F. Kennedy, Fort Bragg, N.C., in 1961. Morris volunteered twice for deployments to Vietnam. Melvin Morris is being recognized for his valorous actions on Sept. 17, 1969, while commanding the Third Company, Third Battalion of the IV Mobile Strike Force near Chi Lang. Then-Staff Sgt. Morris led an advance across enemy lines to retrieve a fallen comrade and single-handedly destroyed an enemy force that had pinned his battalion from a series of bunkers. Staff Sgt. Morris was shot three times as he ran back toward friendly lines with the American casualties, but did not stop until he reached safety. The Distinguished Service Cross was awarded to then Staff Sgt. Morris in April 1970 for extraordinary heroism during this 1969 battle. After receiving the award, he returned to Vietnam the same month for his second tour. He retired at Fort Hood, Texas in May 1985. Morris currently resides in Cocoa, Fla. In addition to the Medal of Honor, Morris received the Distinguished Service Cross (this award will be upgraded to the Medal of Honor on Mar. 18), Bronze Star Medal with one Bronze Oak Leaf Cluster, Purple Heart with one Bronze Oak Leaf Cluster, Meritorious Service Medal, Air Medal, Army Commendation Medal with “V” Device and one Bronze Oak Leaf Cluster, Army Good Conduct Medal Silver with one Loop, National Defense Service Medal, Armed Forces Expeditionary Medal, Vietnam Service Medal with one Silver Star, Non-commissioned Officer Professional Development Ribbon with Numeral “3”, Army Service Ribbon, Overseas Service Ribbon with Numeral “4”, Combat Infantryman Badge, Master Parachutist Badge, Expert Marksmanship Badge with Rifle Bar, Special Forces Tab, Republic of Vietnam Gallantry Cross with Bronze Star, Republic of Vietnam Campaign Medal with “60” Device, Vietnam Parachutist Badge, Republic of Vietnam Gallantry Cross Unit Citation with Palm Device, Republic of Vietnam Civil Actions Honor Medal Citation, First Class. Staff Sgt. Melvin Morris, with Detachment A-403, Company D, 5th Special Forces Group (Airborne), 1st Special Forces, United States Army, distinguished himself by exceptional and extraordinary gallantry and intrepidity, not involving participation in aerial flight, in connection with military operations against a hostile force in the Republic of Vietnam, Sept. 17, 1969, while commanding the Third Company, Third Battalion of the IV Mobile Strike Force. The First and Third battalion of the IV Mobile Strike Force were engaged in a search and clear operation, some five kilometers north and east of Chi Lang, in the IV Corps Tactical Zone. The battalions were deployed with the First and Second Company of each on line, and the Third Company in reserve positions immediately to the read of the main force. Their mission was to sweep an area upon which there was little known intelligence. Within 15 minutes after leaving the line of departure, the Second Company of the Third Battalion entered a heavily mined and booby-trapped wood line, and suffered four serious casualties. Several minutes later, as the Second Company was removing its casualties to the rear, and attempting to determine the depth and width of the enemy mine field, the First Company, on the right flank of the Second Company, observed three NVA soldiers moving from west to east, across the front of the advancing friendly elements, as if to be evading the Second Company. Sgt. 1st Class Ronald D. Hagen, the detachment’s Team Sergeant, and the commander of the First Company, ordered his lead elements to pursue the enemy soldiers, as he himself led the pursuit. The enemy fled into a thick wood line, and as the leading friendly elements entered the wood line, with Hagen in the lead, the enemy initiated a fusillade of fires from a heretofore undiscovered enemy bunker complex. Hagen was immediately wounded, and fell on the top of the most forward bunker. The intensity of the enemy fires was such as to make continued assault impossible, and the friendly forces withdrew. They were unable to retrieve Hagen, whose wounds were serious, and as a result, was unable to move himself. Capt. Thomas M. Daniels III, the battalion commander, had observed the actions of First Company from his position with the Second Company. Aware of the seriousness of Hagen’s wounds, and the precariousness of his position, Daniels began to maneuver the Second Company into a flanking position in an effort to reach Hagen. As he moved forward, he was also met with an onslaught of enemy resistance, and also was wounded. Hit in the arm and the mouth, he was completely unable to suppress the enemy fires. However, as he advanced, the enemy’s fire again struck Hagen, killing him instantly. Unable to continue the advance into the maelstrom of fires, Daniels was forced to order his troops to withdraw, and the rapidly deteriorating situation forced him to call the Third Company forward to reinforce the badly demoralized main elements. Morris’ company had also received some of the enemy fire. Continuously monitoring the radio, he realized that his Team Sergeant had been killed, and that his Team Leader was seriously wounded. He reacted instantly, moving his company into the First and Second Companies, and reorganizing these companies into a fighting force again. Designating several Soldiers to accompany him, Morris began moving up toward the body of his fallen Team Sergeant. There was a lull in the enemy fires, and Morris was able to reach the body and cover it with a poncho. However, as the enemy observed him doing so, they renewed their fires, and two of the men with Morris fell under the barrage. The remainder of those with him withdrew immediately, and Morris was left in a comparably exposed position with the two wounded Soldiers. Continuously returning the enemy fire, Morris began assisting the wounded Soldiers in crawling back toward the friendly position. Once they reached a secure area, Morris jumped up, and with complete disregard for his own safety, began directing the fires of his elements by running from man to man and physically pointing their fires. Having established a base of fire, Morris again began advancing in a crawl toward Hagen. Again, the enemy fires were merciless, and many of the Soldiers he had personally positioned began withdrawing. Morris reached an area within several meters of the bunker complex, and from that position, began throwing hand grenades onto the enemy bunkers nearest him. The enemy increased the volume of their fires, and Morris was again forced to withdraw. Returning to the completely demoralized force, Morris, be sheer strength of persuasion, forced the Soldiers to hold their positions. Hand picking his most loyal and dependable Soldiers, Morris requested the volunteer to help recover the body of Hagen. Appealing to them not necessarily as an American commander to his Soldiers, but as one man to another, Morris succeeded in getting together another element to make the attempt. Again directing a base of fire against enemy positions, Morris began advancing. Realizing the futility of a covered, and thereby slower, advance, Morris began running toward the enemy positions. In retaliation, the enemy again blazed away with extraordinary fire power. As Morris approached the bunker on which the body of Hagen lay, a machine-gun inside the bunker was directed against him. The weapon firing from the port in the bunker was unable to elevate because of the narrowness of the port, and the rounds wet directly between Morris’ legs. Had he not been rapidly advancing, he would have been cut to pieces by those fires. As a result, however, Morris dove to the side and dropped a hand grenade into the bunker. Successfully neutralizing the position, Morris was determined to achieve his objective, and realizing the necessity of neutralizing the adjacent enemy position before he could successfully evacuate his dead comrade, Morris began moving from bunker to bunker, using each bunker as cover from the next one, until he had successfully knocked out three of the immediately adjacent bunkers. So fierce was his single-handed attack, as Morris approached one of the bunkers, two NVA soldiers, totally bewildered by his actions, chose to flee the bunker in which they were fighting, rather than face the onslaught of this seemingly half-crazed American. Morris promptly killed the two enemy soldiers. Single-handedly, Morris had succeeded in reducing the fires that had completely stopped his entire battalion. Remarkably, he had accomplished this improbably objective unscathed. Returning to the body of Hagen, Morris picked up his comrade and began returning to his forces. However, the engagement was not yet over. As Morris came out of the wood line with Hagen, two enemy bunkers, one on each extremity of the complex, selected him as their singular target. Although the friendly forces were able to observe the firing of these bunkers, and attempted to suppress that fire, the enemy was finally able to stop the only force that had been able to penetrate their defense. Morris was hit in the chest, arm and hand. Although wounded, Morris continued to advance toward his own lines, and succeeded in returning Hagen’s body, before he collapsed from his efforts. From the beginning of the encounter, until he was medically evacuated, Morris reacted to each situation with a professionalism, and single-minded determination possessed by few men. Ignoring his personal safety repeatedly, on no less than three occasions he faced insurmountable odds, and finally overcame them. His ability to direct and lead indigenous soldiers into what was for some, certain death, has rarely been equaled. His personal courage was of the highest order, and as a result of his actions, many casualties were avoided. Morris’ extraordinary heroism, gallantry and intrepidity in the face of a superior enemy force, were in keeping with the highest traditions of the military service, and his determined application to his mission, his steadfast leadership, and his amazing physical accomplishments reflect the greatest of credit upon himself, the Special Forces, and the United States Army. Morris is set to receive the Medal of Honor posthumously in a ceremony at the White House on March 18.